We’d love your help. Let us know what’s wrong with this preview of The Risk of Us by Rachel Howard. What is the cost of motherhood? When The Risk of Us opens, we meet a forty-something woman who deeply wants to become a mother. The path that opens up to her and her husband takes them through the foster care system, with the goal of a A poignant, dazzling debut novel about a woman who longs to be a mother and the captivating yet troubled child she and her husband take in. What is the cost of motherhood? When The Risk of Us opens, we meet a forty-something woman who deeply wants to become a mother. The path that opens up to her and her husband takes them through the foster care system, with the goal of adoption. And when seven-year-old Maresa—with inch-deep dimples and a voice that can beam to the moon--comes into their lives, their hearts fill with love. But her rages and troubles threaten to crack open their marriage. Over the course of a year, as Maresa approaches the age at which children become nearly impossible to place, the couple must decide if they can be the parents this child needs, and finalize the adoption—or give her up. To ask other readers questions about The Risk of Us, please sign up. This is not an easy book to read, yet I couldn’t put it down. It’s a short book that manages to cover complex emotions as well as the complexity of the foster care system. The story is narrated by a woman whose name we never learn and she addresses her husband, Sebastian and the troubled child, Maresa who they decide to foster with hopes of adopting. “It starts with a face in a binder. CHILDREN AVAILABLE, reads the cover. the recruitment brochure for this foster services agency says they need fa This is not an easy book to read, yet I couldn’t put it down. It’s a short book that manages to cover complex emotions as well as the complexity of the foster care system. The story is narrated by a woman whose name we never learn and she addresses her husband, Sebastian and the troubled child, Maresa who they decide to foster with hopes of adopting. “It starts with a face in a binder. CHILDREN AVAILABLE, reads the cover. the recruitment brochure for this foster services agency says they need families that “take risks”......” . It becomes Immediately clear how much of a risk to all three of them this is when they take in this troubled seven year old who was taken away from a drug addicted, drug dealing mother, separated from her sister. The scenes of her anger and screams and hitting are tough to read but not more disturbing than the abuse this child has endured. There are difficult, painful moments with what seems like so few of joy. I didn’t know who I felt for the most, this broken little girl or this couple whose marriage feels a little at risk and who have a difficult time dealing with Maresa as well as the snarling facets of the foster care system that they grapple with. Our unnamed narrator is burdened by her own past horrific experiences as a child. I couldn’t help but wonder as she did whether this would help or hurt the situation. They have doubts about whether to finalize the adoption. Do they have the capacity to love this little girl? Is Maresa capable of loving anyone? This is suspenseful until the end when we learn the answer. When looking to see what else the author had written, I noticed that she has written a memoir and the description of it is very much like the experience of the narrator in this novel. It certainly had me wondering how much more of the story was was biographical. In any event, this is an emotional and eye opening story that kept me interested wanting to know how it would end up. Oh my gosh...All the stars. This is a heartbreaking tearful adventure into the frightful world of fostering to adoption. Yes it is excruciatingly sad but whether or not you enjoyed the characters portrayed in this story or even the story itself; it all pales in reality to the truth and children are the most innocent of beings. I love that this book is fiction and reality blended. The author has accomplished both beautifully by underlining fine nuances of the psyche and emotions that run through i Oh my gosh...All the stars. This is a heartbreaking tearful adventure into the frightful world of fostering to adoption. Yes it is excruciatingly sad but whether or not you enjoyed the characters portrayed in this story or even the story itself; it all pales in reality to the truth and children are the most innocent of beings. I love that this book is fiction and reality blended. The author has accomplished both beautifully by underlining fine nuances of the psyche and emotions that run through in fostering and adoptions and juxtaposed to which has also informed us of a gory reality of a child who was mistreated. It is no exaggeration that this story is gripping, shocking and a real page turner. It is such an absorbing read and the characters have become my close friends. Thank you Rachel Howard , you are a talented writer. Thank you NetGalley, Houghton Mifflin Harcourt and Rachel Howard for the opportunity to read this book in exchange for an impartial review; all opinions are my own. This is the story of a couple’s struggle to fall in love with a child, told with lyrical precision and a complete absence of sentimentality. The unnamed narrator is a woman in her forties, a writer and teacher who comes to parenting relatively late and chooses to foster a child with a view to adoption. No surprise, her foster child is troubled and has been abused. Six-year-old Maresa is enchanting: a physically daring, rambunctious kid who likes to sing in her "opera voice" and has a generous he This is the story of a couple’s struggle to fall in love with a child, told with lyrical precision and a complete absence of sentimentality. The unnamed narrator is a woman in her forties, a writer and teacher who comes to parenting relatively late and chooses to foster a child with a view to adoption. No surprise, her foster child is troubled and has been abused. Six-year-old Maresa is enchanting: a physically daring, rambunctious kid who likes to sing in her "opera voice" and has a generous heart. But she also screams “like a knife to your eardrum” and has endured unspeakable things. Howard spares no detail of the challenges of parenting a troubled child: the narrator and her husband Sebastian are artists on a tight budget, and becoming parents means they can afford precious little time to create. Sebastian has a heart condition and Maresa’s rages put pressure on his health. On top of this, the narrator and Sebastian must navigate the foster care system, find the right therapist and negotiate with clueless caseworkers. Howard makes an extraordinarily truthful inventory of the narrator’s feelings, which include doubt, regret, rage and despair. Because parenting is challenging no matter how you do it, this book isn’t just an examination of what it’s like to adopt a troubled kid, it’s also an investigation of motherhood itself. All of this may make this short, intense book sound like a challenging read, but the writing is so deft and extraordinary, that it’s utterly enthralling. THE RISK of us is an incredible book about parenting, adoptions, relationships, and the judgments and expectations society puts on everyone without any easy answers. The way the protagonist, the mother, navigated a world where there are no hard truths and even the expects weren't always right was so well done. You are with her for every moment of her difficult journey--all the doubts and baggage and hope and love and effort--you feel all of it. The way the book gives no one, no matter how meaning THE RISK of us is an incredible book about parenting, adoptions, relationships, and the judgments and expectations society puts on everyone without any easy answers. The way the protagonist, the mother, navigated a world where there are no hard truths and even the expects weren't always right was so well done. You are with her for every moment of her difficult journey--all the doubts and baggage and hope and love and effort--you feel all of it. The way the book gives no one, no matter how meaning an out and creates no real villains is much appreciated. Everyone tries to do what is best, behind their biases and their own needs (even the best intention-ed and least selfish). The grayness and complexity of all the minor characters is just so well done, as is the full and richness of the major ones. This book is most certainly a must read for this. When Sebastian and his wife (who narrates and whose name we never learn) decide to adopt seven-year-old Maresa, they think the books they’ve read and classes they’ve taken have prepared them for the challenge. Maresa is more disturbed and her behavior more difficult than they could have imagined. Now, as adoption day draws nearer, they reconsider the commitment. I interned in a foster to adopt agency and once considered adoption, even taking classes, before ultimately deciding as a single mom I may not be able to handle a child as disturbed as Maresa. Rachel Howard did a spectacular job with the details of Maresa’s likely reactive attachment disorder showing the push/pull of a child wanting and fearing attachment, projecting the pain of trauma and the testing whether her foster-to-adopt parents would accept her. I had a lot of empathy for the narrator, who hadn’t overcome her own childhood trauma. She said the right things to be approved to adopt, but would have been better served if the social workers can recommended ongoing therapy. Howard wrote in second person, which became confusing because she changed “you” from Sebastian to Maresa. I would have rated higher if THE RISK OF US had stuck to one you. This dark, depressing book, was an enjoyable read for me, nonetheless. The ending of THE RISK OF US didn’t live up to the rest of the story for me. I can’t say more without spoiling it. I was drawn to the subject matter of this book and was looking forward to reading it. I am glad that it was a short book because I am not sure I would've finished it if it were much longer, except that I wanted to know how it ended. The writing style was distracting and felt very detached and skipped all over the place to me. It took a few pages to figure out who the narrator was- it kept going back and forth between “I say” and “You say” and I never really grew attached to anyone in the story, I was drawn to the subject matter of this book and was looking forward to reading it. I am glad that it was a short book because I am not sure I would've finished it if it were much longer, except that I wanted to know how it ended. The writing style was distracting and felt very detached and skipped all over the place to me. It took a few pages to figure out who the narrator was- it kept going back and forth between “I say” and “You say” and I never really grew attached to anyone in the story, except the child, Maresa, the only character who had some heart and soul. The therapists were repeatedly called the “blonde bimple therapist”,or the “grey-crowned social worker”, or the “surfer dude” to the point that it was just annoying. Just give them names. Rachel Howard’s THE RISK OF US is a difficult, but impossible to put down ,depiction of one couple’s heartrending journey through the challenging decision to adopt a young girl and the labyrinthian system they must negotiate to do so. Adept with language, structure, layering, and pace, Howard takes the reader on a breathtaking ride that never flinches in its authentic rendering of the difficulty of such a process or the challenges of overcoming and healing abuse. At the same time, she holds us i Rachel Howard’s THE RISK OF US is a difficult, but impossible to put down ,depiction of one couple’s heartrending journey through the challenging decision to adopt a young girl and the labyrinthian system they must negotiate to do so. Adept with language, structure, layering, and pace, Howard takes the reader on a breathtaking ride that never flinches in its authentic rendering of the difficulty of such a process or the challenges of overcoming and healing abuse. At the same time, she holds us in the awareness that no parenting comes with guarantees or without risks. And that all parenting is a commitment to love, however difficult. Short, intense, unflinching, this novel is a superb work of skill and of courage. Really takes a hard look at how much we can teach kids, and what they really understand, and how they can communicate through trauma. And the love that's shown and how everything is to an extent both conditional and unconditional was touching. This is a really beautiful and powerful book that I know will stay with me for a long time. I was automatically drawn to the subject matter of fostering a little girl and the effect this has on a marriage/individuals. The writing style was very unique, moving, thought provoking and intelligent. Unlike anything I've ever read before. Would definitely recommend. I couldn't put this book down. Howard is an incredibly gifted writer who somehow took the story of a couple adopting a seven-year-old girl from the foster care system and turned it into a lyrical yet gripping page-turner. A highly recommended read for all parents, whether interested in adoption of not. A beautiful story. An engaging account of parenthood -- of the way bringing a new life into the picture breaks everything open, with all the complexities on display. Stop browsing reviews and just jump in -- it's an addicting and quick read. Well this doesn't actually have a plot at all. Rachel Howard is a writer of fiction, personal essays, memoir, and dance criticism. 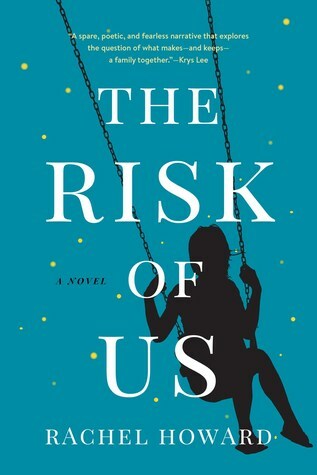 Her debut novel, The Risk of Us, will be published by Houghton Mifflin Harcourt April 2019, and is garnering strong advance praise. Jenny Offill, author of Dept. of Speculation, calls it "An emotionally complex and amazingly suspenseful novel about love and fear." Belle Boggs, author of The Art of Waiting, says: "R Rachel Howard is a writer of fiction, personal essays, memoir, and dance criticism. Her debut novel, The Risk of Us, will be published by Houghton Mifflin Harcourt April 2019, and is garnering strong advance praise. Jenny Offill, author of Dept. of Speculation, calls it "An emotionally complex and amazingly suspenseful novel about love and fear." Belle Boggs, author of The Art of Waiting, says: "Rachel Howard has given us a portrait of family-building and attachment that is at once beautiful and painful, serious and funny, page-turning and insightful. I was deeply moved by this novel, a powerful reminder of the risks we take on whenever we love anyone." Rachel’s first book was a memoir about her father's unsolved murder, The Lost Night. She was interviewed about the book by Ira Glass for an episode of This American Life. She is a graduate of the MFA Program for Writers at Warren Wilson College and a fellow of the MacDowell Colony. Her fiction and nonfiction has appeared in Gulf Coast, ZYZZYVA, Waxwing (nominated for a Pushcart Prize), O Magazine, OZY, Canteen, Berfrois, the Arroyo Literary Review, the Los Angeles Review of Books, and elsewhere. Formerly an arts journalist for the San Francisco Chronicle, she has published arts and dance writing in The New Yorker Online, the New York Times, Ballet Review, and the Hudson Review, among other publications. She lives in Nevada City, CA, where she founded Yuba Writers’ Workshops, and a reading series, Yuba Lit, now a fiscally sponsored project of the Nevada County Arts Council.